When the investment through debt instruments comes to our mind, the obvious choice for everyone is the fixed deposit. Many of us also save through five years tax deposit for last minute tax saving. The internet banking has made it easier to entry and exit from a fixed deposit. But, is it the best investment under debt options? Recently, all the banks have reduced the interest rate significantly. The largest bank of India, SBI is not offering 7% even for the fixed deposit of any duration. For a longer period, equity is the best investment options. But for a shorter tenure, you cannot ignore the debt investments such as PPF, Sukanya Samriddhi Yojana, fixed deposits, NSC, Debt Mutual Funds etc. 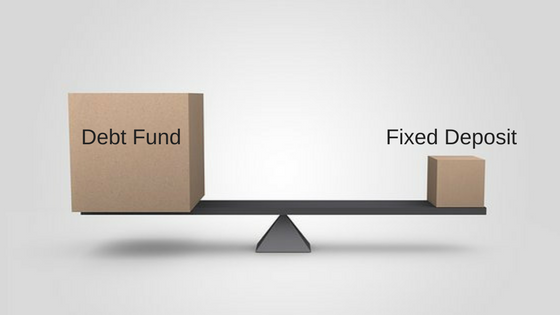 In this article, we will look at the advantages and disadvantages of debt mutual fund vs fixed deposit with respect to the following points. The interests from fixed deposits are added into the income and you have to pay tax accordingly. If you are in 30% tax bracket, your tax liability from fixed deposit will be 30% of interest income. Debt mutual funds have a different tax liability since there is a risk in investment. If you sell within three years it will be called as short term capital gain. Short term capital gain is added to your income and shall be taxed at the applicable slab rate. But the selling after 3 years gives you the indexation benefit while calculating the long term capital gain tax. The long term capital gain tax will be 20% flat after taking the indexation benefit. It may be as good as nil due to indexation benefit. Fixed deposits are liquidated easily. The term deposit through internet banking is just a click away. So, if you need money, you can always access that but there is a penalty in the applicable interest rate. The banks generally charge 1% as a penalty when you break the deposit before its maturity period. Debt mutual funds have charges or penalty ranges between 0.5%-2% for redeeming it early. Exit load is applicable for funds if you redeem the fund within the pre-fixed time period ranges between 6 months to 2 years. Fixed Deposits have guaranteed a return on investment and it is not changed after the investment. The typical rate of return on a fixed deposit is around 6%-7% in a year. You can calculate your maturity amount while investing and plan finances accordingly. Debt funds do not guarantee you a fixed maturity since it is market linked like equity mutual funds. The only difference between equity mutual fund and debt mutual fund is that the equity funds invest in stocks and debt funds invest in government bonds, securities etc. You cannot calculate your maturity amount during investment and it can vary. Generally, a debt mutual fund gives a return ranges between 8%-12% which is slightly higher than fixed deposit. The following table is the comparison between typical return on fixed deposit and one of debt funds at different tenure. The data is captured from Bankbazar for fixed deposits and Valueresearchonline for debt fund on 21st March, 2017. First, you select your time period for investment. In case you are investing for less than three years, the tax liability of fixed deposit is the same as debt funds. The debt funds are market linked and investors have to bear the higher risk than the fixed deposit. Those who can take the moderate risk for slightly higher return can invest in the debt funds. And those who want guaranteed return can invest in fixed deposit. In case you are investing the money for more than three years and ready to take some amount of risk, can invest in the debt funds. It has indexation benefit while calculating the long term capital gain tax. Debt funds will be an ideal investment for you if you are in the 30% tax bracket. In this case, the post-tax return will be higher than the fixed deposit. 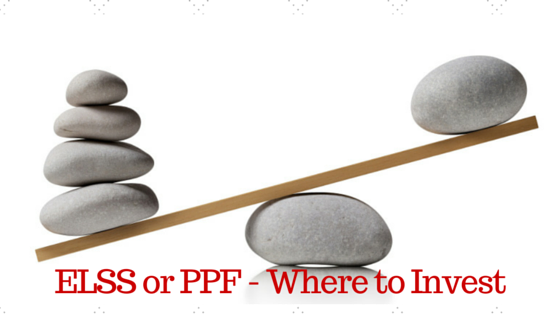 Some financial institutions are still offering better interest rate on FD. why bank having different rates from bank to bank and bank to institutions. I was checking Bajaj Finance website they mentioned Rate of interest @8.10%. Please suggest me where to invest with best interest rate or in bank only?